For several years, I have been fortunate enough to collaborate with Australian Hugh Daniel, who advises the International Paralympic Committee (IPC) on the methods that it uses to ensure fair competition among athletes with varying physical and mental abilities. How, for example, might one compare the performances of swimmers who have different levels of visual impairment? Such comparisons are needed as some ability classes contain few competitors, and separate medal allocations for these athletes would detract from the achievements of competitors in larger classes. Rio 2016 includes 16 medal competitions for men’s 100-metres runners and none for cerebral palsy long-distance runners. If three athletes were to compete for the latter, they would all win guaranteed medals unlike the sprinters who must defeat many rivals to win. One method that the IPC uses to compare different ability classes involves neutralising advantages by combining similar classes and excluding others, imposing the use of specialised technology such as eyeshades and wheelchairs, or ensuring that team members collectively satisfy a minimum aggregate handicap requirement. This approach mostly applies to team sports and includes basketball (wheelchair), goalball (visually impaired), boccia (cerebral palsy), archery (physically disabled) and judo (visually impaired). This approach is simple, effective and consistent. Another method that applies mostly to individual sports such as running, cycling, equestrian, swimming, rowing, sailing, triathlon, alpine skiing and cross-country skiing involves adjusting the results to reflect class abilities. These adjustments ensure that different classes of ability can compete against one another fairly. Consider a sport where the best results correspond to the smallest times, such as running and swimming. Now suppose that we wish to compare the performances of athletes across several distinct ability classes. Roughly speaking, we calculate the average time for each class and then multiply each athlete’s racing time by the ratio of the best class average to their specific class average. 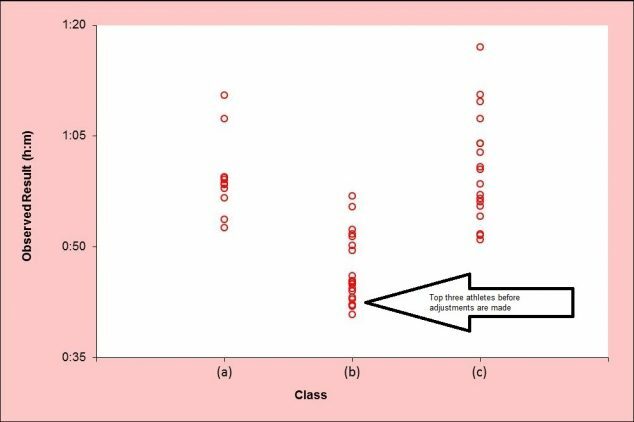 If athletes in a particular class generally take twice the time to finish as those in the best class, then their racing times will be halved to enable fair comparisons. The choice of average is important. Rather than using the most common, arithmetic means, we use the medians for improved robustness against outliers and to lessen any opportunity for competitors to collude and influence results unfairly. We also modify the averages slightly to allow for varying class sizes. 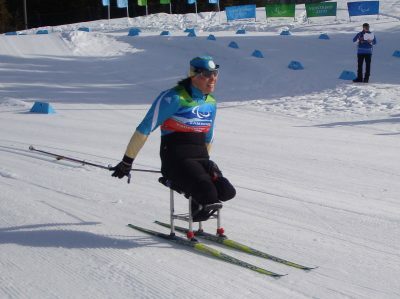 To illustrate this handicapping system in practice, consider men’s cross-country skiing at the Sochi 2014 Winter Games. This sport had three functional classes: (a) 20km classical technique visually impaired; (b) 15km sitting; (c) 20km classical technique standing. The table presents the observed racing results for this competition, while the graphs respectively display the observed racing results and the scoring results calculated using our handicapping method. 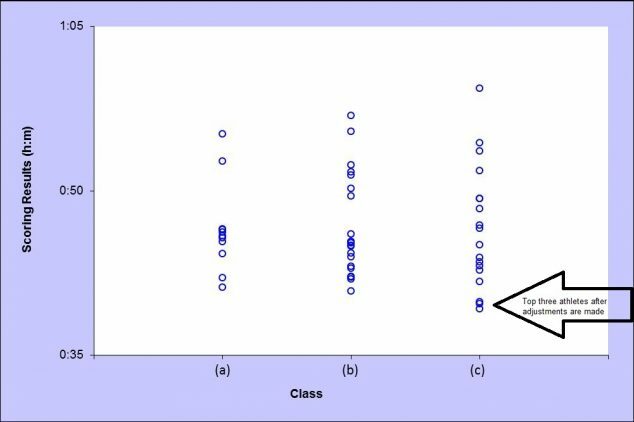 On average, sitting skiers in class (b) clearly take less time to complete their race than those in other classes, partly due to the lesser distance that they cover. Their finishing times remain unchanged by our handicapping. However, after adjusting the observed results, we see that all three medals would be awarded to standing skiers in class (c). In practical terms, this is because those three athletes performed substantially better than other competitors in their class. Fourth place would be awarded to the best sitting skier and fifth place would be awarded to the best visually impaired skier according to this analysis. These particular events actually supported separate awards ceremonies, so the best three athletes in each class won medals. However, this preliminary analysis suggests that this system might prove to be especially useful for competitions and events with fewer competitors. Graph showing men’s cross-country skiing racing results at the Sochi 2014 Winter Games before any handicapping adjustments have been made. A look at the mathematics behind the efforts of all those who have tried to “bend it like Beckham”. Changes to the rules of gymnastics left a lot of people unhappy when they lost the “perfect 10”. Swimming records have tumbled thanks to futuristic swimsuits designed with mathematical precision.